Chris Main was on episode 18 of the Expert Table Tennis Podcast where he was interviewed by Ben Larcombe to discuss & chat about North Ayrshire TTC and table tennis in general. 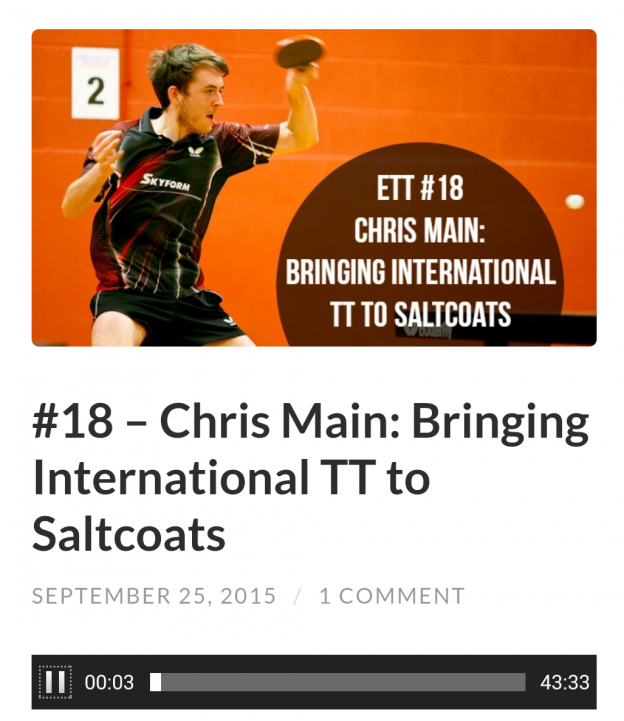 It is a an interesting listen to anyone who has or is involved in table tennis and can be listened to here – www.experttabletennis.com/chris-main-bringing-international-tt-to-saltcoats/. Ben Larcombe has been involved in several table tennis related things over the past year or so, he was the coach in “Guy Plays Table Tennis Every Day for a Year” which went viral and has over 1.5 million views (www.youtube.com/watch?v=4y21uwFUgkE) and is the driving force behind Eastfield Co which is a brand new table tennis company with rubbers, blades and batcases being released very soon. www.eastfieldco.com. Chris Main is the head coach of North Ayrshire Table Tennis Club, a thriving club located on the West Coast of Scotland in Saltcoats. Saltcoats is a small town about 45 minutes away from Glasgow but Chris is on a mission to transform it into a hub of table tennis activity. The club has won the Scottish National League four years in a row, is home to a number of top junior and senior Scottish players, and recently hosted the first round of the prestigious ETTU Cup (which is basically the UEFA Europa League of table tennis). On top of that they have a professional website and logo, host the North Ayrshire Open each year, and have managed to secure funding from Sport Scotland and the local council. Basically, they are doing everything right! With so much going on at the club I thought it would be a great idea to get Chris on the show and find out a little more about his story and his plans for the future of the club, and Scottish table tennis in general. We talk about a whole range of different topics so there is something for everyone in this interview whether you are a player, a coach, or someone involved in running a club and promoting the sport of table tennis in your area. How Chris first got into table tennis. What he did to improve so quickly as a relative late-starter. Chris’s views on talent vs practice and what he looks for in a player. Why it is so difficult to improve your table tennis as an adult. How table tennis is organised differently in Belgium. All about the ETTU Cup and how North Ayrshire got on. How Chris manages to coach and play at the same time. What Chris believes is most important for beginners to understand. Chris’s top tip for table tennis players. The future plans for the club.